Today we’re talking about one of the neatest World War II era guns, the Welrod pistol. 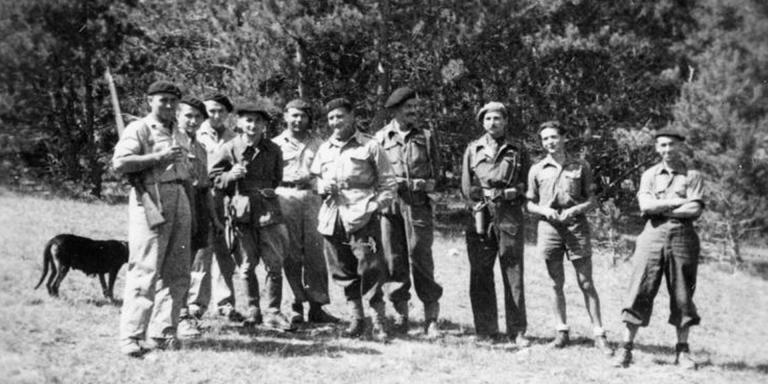 If you’ve read some of my other posts here on Pew Pew Tactical, you may have picked up on the fact that I’m a bit of a history nerd (and a bit of a nerd in general). The Welrod is a suppressed bolt action pistol that was developed by the British Secret Intelligence Service (SOE back then) around the middle of the Second World War. It’s the archetypical firearm of that period of espionage. For that reason – and because it’s just an all-around cool gun – the Welrod is still very well known, despite the fact that it may or may not still be in production and that ownership of the pistol is controlled by the ATF. You can own one if you can own a firearm and a suppressor – our Suppressors: FAQ & Mainteance article can help you find out if you’re allowed to in your state! Have I piqued your interest? Good! The Welrod was designed in 1942 at the Inter-Services Research Bureau (later called Station IX), near Welwyn Garden City in the United Kingdom, but we don’t know when – or if – the Welrod stopped being produced. Originally, the Welrod was designed by Major Hugh Reeves, a British engineer who also originated other important espionage weapons, like the similarly designed single-shot sleeve gun. The Welrod was devised for use by resistance forces and other irregular military forces but was primarily used by the Special Operations Executive (SOE), a World War II British espionage organization that was established in 1940 and disbanded shortly after the end of the war. 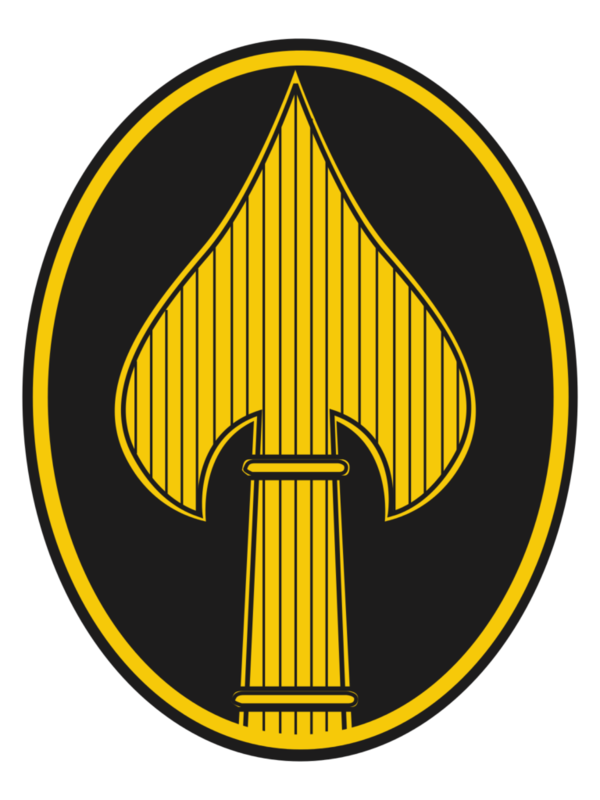 It was also used by the American Office of Strategic Services (OSS) – the predecessor of the modern Central Intelligence Agency, by Danish special forces, and by various Allied resistance forces. However, because of the secretive nature of the work that the Welrod was used for, there’s very little information about where and when it was used, and it could have easily been secretly used by other forces that didn’t make the history books. 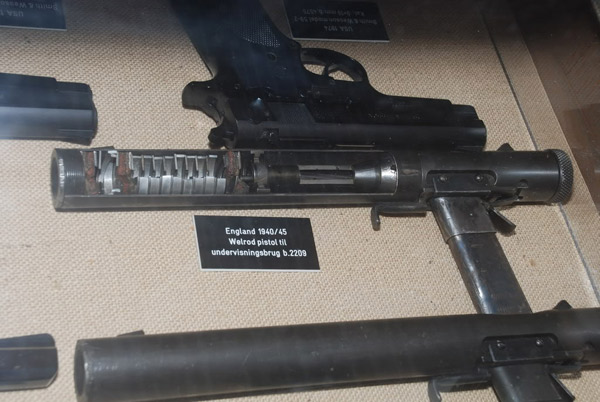 After World War II, the Welrod is also reported to have been used during the Korean War, the Vietnam War, the Troubles in Northern Ireland, the Falklands War, and even during Operation Desert Storm. Welrods were also found in weapons caches from Operation Gladio, a clandestine Italian-led NATO stay-behind mission during the Cold War. The Welrod’s suppressor was incredibly effective compared to its contemporaries, and even outshines the bulk of modern suppressors. However, it does so at the cost of rate of fire and effective range. When fired, the Welrod is only 73db or about the same volume as the average vacuum cleaner. Here’s some context for exactly how quiet the Welrod is. The physical appearance of the Welrod is also designed for espionage. Disassembled, the Welrod resembles generic industrial piping. The gun is essentially comprised of a foot long cylinder with a diameter of 1.25 in. 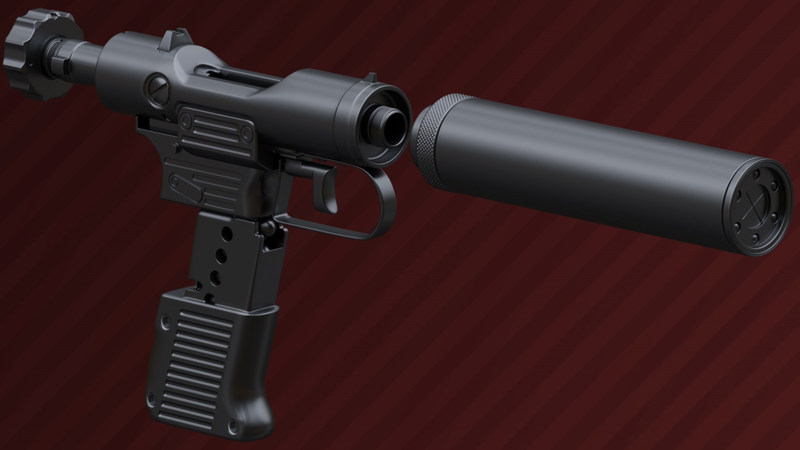 The bolt and a knurled knob that acts as the bolt handle are at the back of the cylinder, while the middle contains the pistol’s ported barrel and the suppressor’s expansion chamber, and the front houses the baffles and wipes of the suppressor. Of course, when the detachable magazine, which doubles as the Welrod’s pistol grip, is inserted, the Welrod’s true function becomes much more clear. The Welrod’s ported barrel is an essential part of what keeps the gun so quiet; it slowly releases the gas into the suppressor and limits the bullet velocity to below subsonic speeds. The baffles and rubber wipes support the former function by slowing the gases even more. Even with the limited firepower, accuracy was a prime design goal for the weapon. Though the gun’s maximum suggested range is 25-yards, it was realistically used at point-blank or near-point-blank range. It also came equipped with fluorescent sights to further aid accuracy, especially in l0w-light. The bolt-action design was chosen because it is quiet, but also fast and reliable. The Welrod was also a “sanitized” gun, meaning that aside from a serial number and coded symbols, the pistol had no marks that identified either a manufacturer or a country of origin. However, since the Welrod’s original manufacturing, Birmingham Small Arms Company Limited (BSA) has come forward to confirm that they produced some Welrod pistols, but apparently not all of them. Who else was involved in the production is as much of a secret as who the Welrod’s were used against. 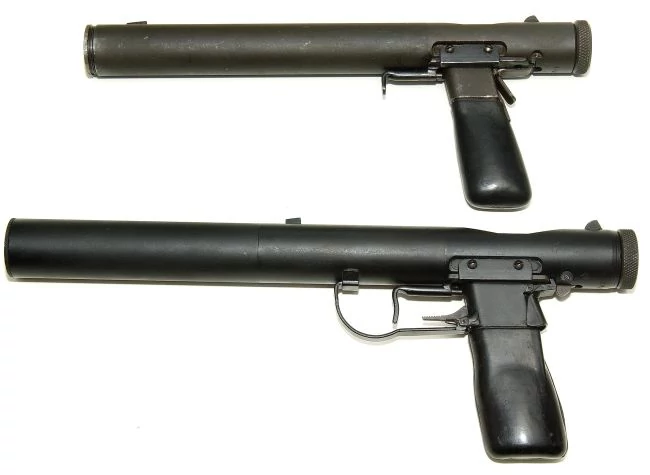 Two different versions of the Welrod were produced, the MkII and the MkI. Despite the name, the MkII was actually the first version of the Welrod to be produced, and by far the more common. About 14,000 MkIIs were produced. At 38 ounces and a foot long, the MkII was bulky for a gun designed for covert ops, but the size was necessary to house all the equipment needed to keep the gun as quiet as possible. The MkII was chambered for .32 ACP, a caliber also popular among German, Italian, and Japanese pistols, making it possible to dip into stores of captured ammunition if the need arose. Although intended more likely for one-shot, one-kill kind of work – the magazine in the MkII held 8 rounds of .32 ACP. Redesigned for the 9mm Parabellum, the MkI was a heftier gun with a lower magazine capacity. The MkI was 2.22 inches longer than the MkII and weighed 14 ounces more with a magazine reduced to only holding six rounds. Because of these features, the MkI was far less popular than its predecessor, and (as far as documents show) only about 2800 were produced. However, the MkI is also the version of the Welrod that is more commonly reported to have been used in conflicts post-WWII. Probably mostly because of the fact that it was in 9mm. There are even rumors that the MkI is still in use by intelligence agents and special ops forces today…but those are just rumors. A modern version of the Welrod is the Brügger & Thomet VP9. Although it looks like a Welrod and it might smell like one too, the B&T VP9 is advertised exclusively for veterinary use as a humane way to put down injured or dangerous animals without having to get close to the animal and without alarming nearby animals or humans. The VP9 works very similarly to the Welrod, with a ported barrel to slow the flow of gas, but it’s not as quiet. 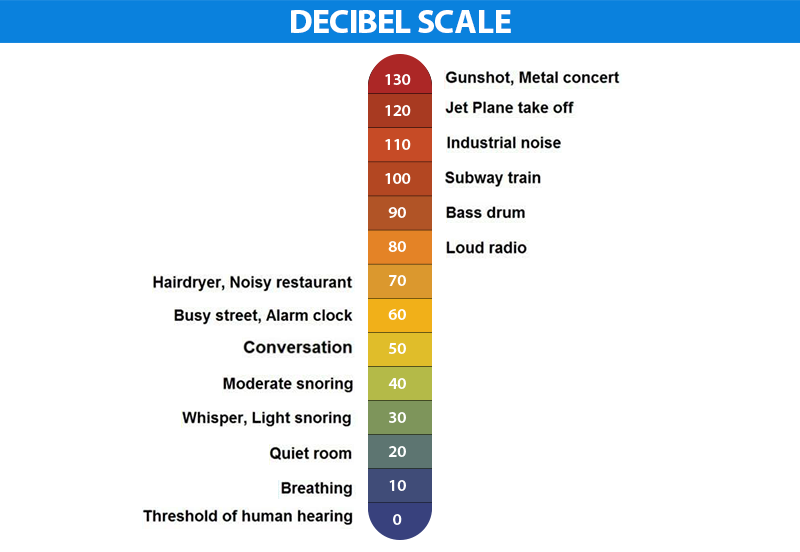 Even with subsonic ammunition, the sound of a VP9 firing is 125 decibel, about the same volume as a pneumatic drill or a popping balloon. It’s also a bit more petite than the Welrod, weighing a bit under 32 ounces and measuring about 11 inches in length. Like the Welrod Mk1, the B&T VP9 is chambered for 9mm, but the VP9’s magazine only holds 5 rounds. The VP9’s magazine can be detached from the receiver, but the suppressor can also be separated. Also like with the Mk1, there are rumors of the B&T VP9 being used in modern conflicts in the Middle East, particularly in Iraq and Syria. While researching for this post, I looked into the rumors surrounding the current use of the Welrod and B&T VP9 by various military and intelligence forces but was unable to find very compelling evidence in support of these rumors. Much of the evidence is based on anecdotes and photos that are said to exist, but I was unable to find published on the internet. On the other hand, I also wasn’t able to find any evidence definitively disproving the claims and the Welrod is, of course, an espionage gun. Considering the gun’s secretive past, who can really say for sure what the truth is? Know of other awesome covert weapons? What other historical weapons do you want to know about? Let us know in the comments! Want to suppress a little bit easier…check out Best Suppressor Companies. The post Welrod: Ultimate WWII Suppressed Pistol appeared first on Pew Pew Tactical.